Over the weekend I made something pretty awesome and I have to share it with you or else I could become known as the worst person in the world. In reality, that probably isn’t likely but in my mind it’s a possibility. So today I present to you Roasted Garlic Hummus Toast with Broccoli Sprouts, Cucumber and Sundried Tomatoes. It’s probably one of the most simplest recipes in the world but it tastes like one of the most delicious recipes in the world. Hearty whole grain bread is spread with robust roasted garlic hummus. Delicate broccoli sprouts take their place atop the hummus. Sliced English cucumber nestle themselves upon the sprouts. 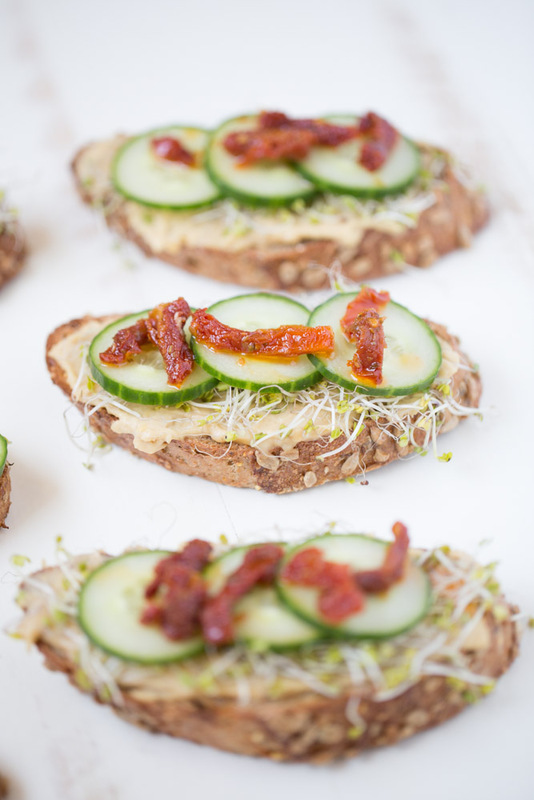 Savory sundried tomatoes garnish the tops of these little toasts. So in Florida news, there’s a storm brewing that could possibly become a hurricane that could possibly hit Florida on Monday. ERIKA. Am I scared or anxious? Not at all. I’m one of the weirdos who loves extreme weather. Since I was a kid, I have been fascinated with extreme weather. I’ve dreamed of becoming a meteorologist. I’ve envisioned myself teaming up with a group of storm chasers and chasing the most gigantic tornado ever. I become giddy and excited at the chance of a hurricane gracing us with its presence. Of course, I do not like the chaos that a hurricane brings to many people, the destruction and damage. But Erika, I can get excited about Erika. It’s only supposed to be a strong tropical storm or weak hurricane when it reaches Florida (should it reach Florida). There’s room for excitement. I’ll save some room for excitement for this Roasted Garlic Hummus Toast and keep the ingredients stocked in my fridge, should we get a day of from work due to the hurricane. Hurricane day, FTW. 6 slices whole grain bread. I sliced 6 slices from a multigrain loaf. I sliced at a diagonal, about 1-2 inch thick. Brush each slice of bread with a little olive oil. Place each slice directly on the oven grate and bake for 3-5 Minutes or until toasty. Remove from oven and place on a serving tray or plate. Spread each toast with some of the roasted garlic hummus. Top with some sprouts. Top with sliced cucumber and then sundried tomatoes. It’s easy and it looks so good, that’s my favorite kind of recipe! Oh, the joys of living in Florida during hurricane season! I don’t usually mind a slow hurricane season :) And I definitely want this hummus toast for lunch. Roasted garlic hummus is my favorite. I need to make these easy toasts! I’m obsessed with all hummus. And bacon? And garlic? on toast? You’re the best!! Thank you, Aimee! Hummus is so good! Yeah, hurricane season! This toast looks perfect! Love it, so simple, can’t wait to try it! Yummy, yummy! Perfect little toasts! Pinned! I love Twister! It’s one of my favorite movies as well. I’ve lived in Florida all my life and I’ve only experienced 2 hurricanes. Everything else that has hit the state has only given the places I lived tropical storm force winds/rain or just regular thunderstorms since the hurricane came on land so far from where I lived. I’m the same way with storms! As long as nothing horrible happens :) Love this healthy treat! Thanks Julie! Erika dissipated but we are still getting some nasty storms from it. A lot of lightening and heavy rain. I love it! mmmmmmmmmmmmmmmm hummus toast is one of my favorite breakfast foods! I should probably add sprouts, cucumber and sun-dried tomatoes to the grocery list! Thanks Cheyanne! Hope you enjoy the recipe! Awesome post! I would love to invite you to my new link party The Beautifully Creative Inspired. The party launched today and will continue every Fridays at 9AM eastern time on 5 BLOGS! It runs until Wednesday night :D Hope you can party with us! Congratulations! This is going to be featured over at Diana Rambles tomorrow and has been pinned in the Featured at Diana Rambles board at Pinterest, Tweeted, Yummed and Stumbled. Please grab a featured button off my button page or via the post guidelines graphic. Thanks for sharing this awesome idea!